When I arm my quad copter the motors oscillate between max and no throttler really fast. I have spent a week messing with settings trying to fix it and cannot seem to find out the problem. This is also my first build so I am not entirely sure what I am doing mostly been trying to follow YouTube tutorials. I am using a Naze32 rev6, and Dys 45A 4in ESC. I do not know if it is an incapability of my hardware or if it is my software settings just not being right. Yes I changed the mixer, pin 0 was not working on my flight controller so I re-mapped it to pin 4. And yes the props are off, I was trying to make sure it all worked, It just seemed like weird behave and not normal. I will try with the props on and see what happens. So, I put props on and tried it but its the same problem, the motors oscillate between max and min throttle really fast. I could not take it off because the constant speed change in the motors caused it to shake to much. After watching the video you posted I do not think it is any of them problems. As they would cause one or two motors to just continually speed until it flips (I also did everything he said in the video and everything checked out fine). Un-like my problem in which my motors just oscillate between max and min power really fast shaking the quad. More then likely it is one of those issues in the video. They have a safety feature called anti Taz mode stopping it from flopping all over the place now. Take your time and recheck all those points one at a time. Pretty sure you will find it. If not. Make a short video so we can see the behavior. Edit: after some thought... im fairly sure your channel mapping is mot matching between radio and fc. My guess is throttle is mapped to pitch or roll and is throttling up to 50% then taz mode kicks in and cuts throttle. Then it all repeats. I rechecked everything and it seems to me to be all good. I did everything in the video twice and it all worked how he said it would. Also you mentioned that mapping between radio and fc my be off, so I checked that and in betaflight when I move the throttle stick on my radio the throttle moves in betaflight same with every other stick. Here is a video of what the motor out put looks like through betaflight. I tried getting a video of the quad but you cant see what is going on or hear anything as I only have a phone camera which did not work great. so I figure this would be more helpful. But it also causes the quad to shake so violently that it broke apart. This is also with me just turning the quad on and no input to any of the sticks. I hope you had the props OFF! Is that the idle? With the quad just armed? What happens when you don’t arm the quad and just tick the motor box that allows you to move the master slider and run the motors without any PID looping? If it’s stable on that and the motors run evenly with just the PWM signal from the FC then it’s likely to do with the rates and settings of the FC. I thought Naze32 support in Betaflight was pretty much dead? F4 boards are cheap enough that there’s no real reason not to use something more modern which will be easier to troubleshoot and will run Betaflight 3.5. Did it ever run OK? Did you save the original factory settings on the board first, before making any changes? Yes it is idle with it just being armed. When I don't arm it and just tick the box and move the master switch it works fine. How do I know what settings to change, that will help? or what are some good settings to start at with trying? It maybe I am new to this. I would be willing to buy a different broad any you suggest? It has never run OK, this is my first time hooking it up. I did not save the factory settings. I did not know it came with any, I figured it arrived blank. Try changing your ESC protocol to PWM, I think that's all the naze can handle. A new board would open up better options. What other parts does it have, like ESC’s, receiver, camera etc? What size is the quad and what mounting size for the FC? Those things will determine which boards you can use. Check out Oscar Liang’s pages on flight controllers to see some of the options, he has a good one for newer builders. The settings you are going to need to look at if you want that to work are the motor control ones, as noted above. I can’t remember which page they are on, when I get back from flying this morning I will get a look at Betaflight. 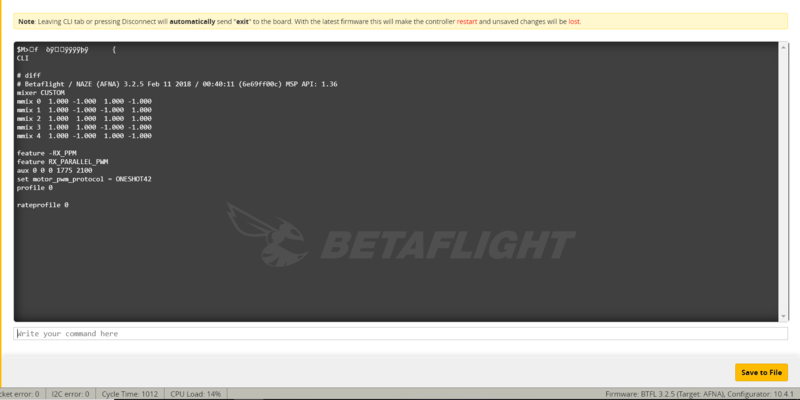 Also which version of Betaflight is flashed to the board? After 3.0.1 there is no Naze32 support and using later versions could be what is causing your problem. Just one more question, has this quad ever run right or is this problem what’s stopping you going flying? I had a look around, DYS make an F4 mini board that they sell bundled with your ESC or separately but some people report issues with it, which makes me not want to recommend it. CL racing make this excellent F4 mini, which uses the full size F4 chip, they have a good reputation but I have not personally used this board. It will interface with your ESC via a plug or solder pads and has everything you would want on it, plus it will run Betaflight 3.5. @PsyBorg may have a recommendation that he has used. What happens if you hold it. Then arm it with no props on. That spikes a TON if noise instantly like the fc is just floppin around. Or like you have no foam feet on the frame on a hard surface with like a bent shaft. Not knowing your knowlege of quads its hard to direct you. Normally I would say on a naze to go with oneshot125 in betaflight and make sure the escs can do that older protocol. There should normally be some odd spooling going on just sitting on a table. If the accelerometers have been calibrated it should seek level. When it changes to correct and there is no change it will keep trying to correct. This usually results in 2 motors spooling up and two slowing down. On yours the gyros are going nuts instantly which looks like a massive vibration from something. Another thing to try is do an accelerometer calibration. Set pitch p gain to 40 roll to 60 and yaw to 80. Set all I gains to 40 and all d gains to 20. That should make any properly set up flight controller be able to get into a decent state to at least hover. I took the fc out of the quad and held it when I armed it, that fixed the issue. So their must just be vibrations causing it. The fc is just mounted to the quad and their is not foam on the feet. It was sitting on carpet so I figured that would damp it enough, I guess not. I am going to get double sided foam tape to mount the fc, and put foam on the feet, and hopefully that helps. I feel so stupid this was such a noob mistake. Thanks everyone for the help, and being so patient. No such thing as noob mistakes. Trust me you make simple mistakes later on as well. You will just kick yourself harder for brushing over a simple thing and messing it up hehe. Awesome job! Glad to hear it’s fixed. Get rubber isolated mounts for it when you put it back together and see if that keeps it sweet.